Amid a rising legislative chorus demanding a halt to corporate buybacks (an activity which was illegal until 1982), with Congress realizing that most of the funds released by Trump's tax cut and offshore tax repatriation were used not for capex or hiring but merely to levitate stock prices, last week Goldman's chief equity strategist published the most "inspired" defense of buybacks, in which he said that from a portfolio strategy perspective, "the potential restriction on buybacks would likely have five implications for the US equity market: (1) slow EPS growth; (2) boost cash spending on dividends, M&A, and debt paydown; (3) widen trading ranges; (4) reduce demand for shares; and (5) lower company valuations." Or, as we summarized it, if Congress were to ban buybacks, it would likely crash the market. Hence Goldman's increasingly vocal defense of corporate buybacks, which incidentally are the biggest source of stock demand in the past decade. Then, just a few days later, Goldman - clearly worried that the anti-buyback push is gathering steam in Congress - published yet another research report discussing the "Buyback Realities", in which it paradoxically tried to mitigate the role buybacks have on price formation and capital misallocation just one week after it explained how banning buybacks would have disastrous consequences for stocks. 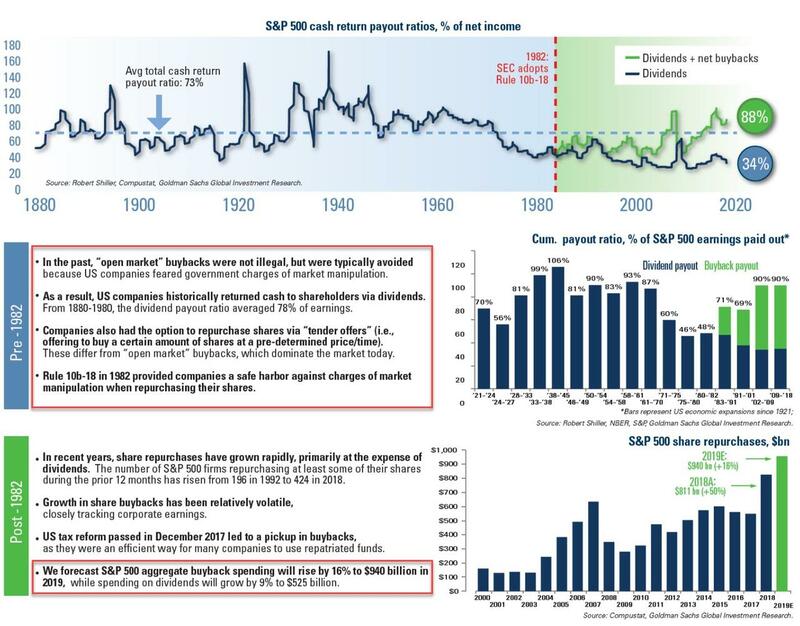 Of note, one of the charts in the defensive report had the following informative summary on the history of buybacks, in which Goldman explained that "in the past buybacks were not illegal [ZH: they were illegal prior to 1982] but were typically avoided because US companies feared government charges of market manipulation." As a result, for decades US companies returned cash to shareholders almost exclusively via dividends, and from 1880 to 1980, the dividend payout ratio averaged 78% of earnings (companies also had the option to repurchase shares via tender offers, in which they would buy a certain amount of shares at a pre-determined price/time, however the price moving impact of such operations was virtually nil). In short, buybacks were illegal until 1982 for a reason - market manipulation - and then they gradually became mainstream, with stock buybacks and dividends rising to 90% of the cumulative payout ratio of S&P 500 earnings in the 2002-2018 period. 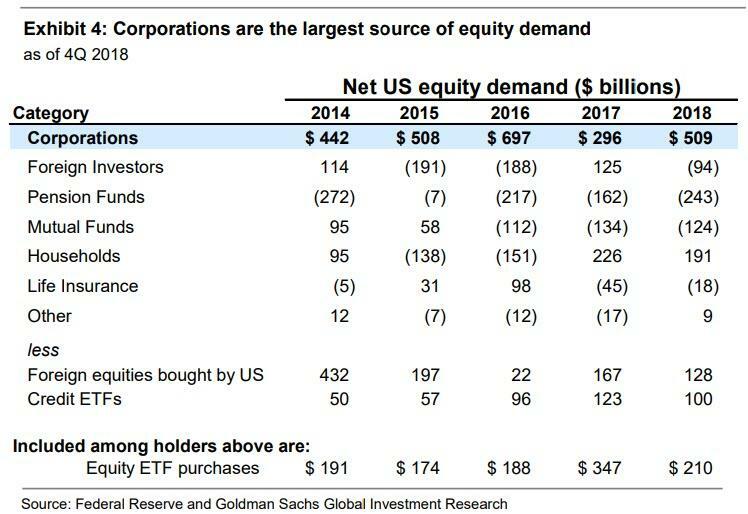 The cherry on top: in 2019, Goldman forecasts companies will spend a record $940 billion on buybacks (with $1.1 trillion in buyback announcements) up 16% from the prior record hit in 2018. So while it remains to be seen if Congress will ban buybacks, one thing is certain: as Goldman's David Kostin cautioned last week, without company buybacks, demand for shares would fall dramatically, for one simple reason: repurchases have consistently been the largest source of US equity demand. Since 2010, corporate demand for shares has far exceeded demand from all other investor categories combined. Net buybacks for all US equities averaged $420 billion annually during the past nine years. In contrast, during this period, average annual equity demand from households, mutual funds, pension funds, and foreign investors was less than $10 billion for each category – despite the fact these categories collectively own 83% of corporate equities. Buybacks represented the largest source of equity demand in 2018. This is shown in the table below. Then, overnight, Kostin reiterated this point, saying that "buybacks remain the largest source of net demand for US equities. Other ownership categories have been generally reducing equity exposure, including mutual funds." What this means is the following: with buybacks having become the most important marginal buyer of stocks, the one trading desk that dominates the daily flow of buybacks - which amount to just under $3 billion in gross purchases each and every day - has more influence on the overall market than even the NY Fed. And the person who controls that trading desk will be the most powerful person on Wall Street. Kearns, a name few have ever heard of - certainly not a name on par with Stevie Cohen, Israel Englander, Larry Fink, Lloyd Blankfein, Jamie Dimon, Bill Dudley or any other hedge fund billionaire that is part of the Wall Street folklore - is the head of Goldman Sachs’ corporate trading desk: the desk the executes hundreds of billions in corporate buyback orders for clients all around the world. And with Goldman sporting the largest buyback trading desk on Wall Street, it wouldn't be a stretch to say that - with the fate of the stock market in the hands of corporate buybacks - Neil is the most powerful man on Wall Street right now. In its latest "Top of Mind" publication, Goldman sat down with Kearns, this "master of the buyback universe", to address the size, impact, and outlook for US share repurchases. Since Neil is the man that sees more buyback dollars executed in any year than anyone else, he is just the right man to answer all buyback related questions.